Singapore’s remarkable development under Lee Kuan Yew, using the hard indicators of home ownership, level of education, degree of technological advancement, extent of foreign investments, etc, has seen few parallels, making it a poster child for economic progress in the developing world. Consistently ranked among the top three in international surveys on best-performing airports, sea-ports, world’s most livable cities, best infrastructure, etc, Singapore receives the most enthusiastic accolades from foreign visitors instantly impressed by the cleanliness, orderliness and gleaming appearance of the city state. How could such a brilliant paradigm, a model of classic realpolitik, be the cause of the GE 2011 political demise of Lee Kuan Yew? The answer: mainly because it had no place for human values. It was a model of governance where, if there had ever been a conflict of Head vs Heart, IQ vs EQ, Hardware vs Heartware, it had been resolved long ago in the defeat of presumably worthless human emotions. This light-hearted little anecdote is meant to provide a probable reason, though in a rather circuitous manner, for MM’s ironic downfall: the material prosperity that he had given Singapore, which many world leaders could never match, was no longer enough compensation to Singaporeans for the soullessness that was beginning to show in the society . For the fear that his strongman approach had instilled in them for so long, denying them the fundamental democratic liberties of open debate, public criticism and an independent media, that are taken for granted in practising democracies, had made them mere cogs in the machinery of a vast capitalist enterprise. It is often said by less perceptive critics that Mr Lee does not care for human beings; that he measures progress in terms of factories, buildings and quantifiable wealth. None of these would have been possible had there not been a transformation in the mind and character of the Singaporean as well. People with a slave mentality and with unpacked bags could not have created the clean, prosperous and dynamic Singapore we see today. Far more than many people realise, Mr Lee’s basic concern has been and still is first with the quality of men and only after, with machines, bricks, mortar and the Singapore dollar. The aspect of his leadership has gone unrecognised because transformation of a people’s mental attitude and character requires a special kind of tough leadership which could be mistaken for one without human sympathies and feelings. In short, if I correctly read the Prime Minister’s mind, his goal is not a nation of rabbits led by lions, or a nation of lions led by rabbits, or worse still, rabbits led by rabbits, but as befits the Lion City, a nation of lions led by lions. Only such a Singapore can, in a world of prowling hungry predators, be assured of a secure and honorable existence. His main concern is to create Singaporeans of quality since the numbers game is not for us. He knows full well that as with great adversity, prosperity too, if improperly enjoyed, can transform lions into fattened rabbits. On one extreme end, we’ve Catherine Lim accusing LKY of being an obsessively rational leader who treats Singaporeans as economic digits. On the other end, we’ve S. Rajaratnam defending LKY’s style of leadership, that ultimately he wants Singaporeans to be characters of strength. He has a very mixed legacy – which great and historical leader hasn’t? PM Lee has announced his new Cabinet – without MM Lee and SM Goh – and it was a surprise to me on two counts. Firstly, instead of grooming some of their newfound talent the usual way e.g. appoint them minister of state, rotate around the ministries, before finally heading one ministry etc, two newly-elected MPs are going to be ministers right away. Secondly, three ministers associated with unpopular policies were ‘retired’ despite being re-elected, albeit with much lower margins. I’d thought the PM would allow these ministers to continue, except for Wong Kan Seng, who was more or less slated for retirement. 1. Wong Kan Seng, DPM and Co-Ordinating Minister for National Security, suffered much of the opposition’s assault over the Mas Selemat issue. He was challenged by opposition veteran Chiam See Tong, and polled 56.93 percent in Bishan Toa-Payoh GRC, lower than the national vote of 60.1 percent. I’d thought he’d become Senior Minister (pending retirement) despite all these, but PM Lee chose to leave him out of the Cabinet, unceremoniously ending his lengthy political career which saw him heading key ministries like home affairs and foreign affairs. Without his Cabinet appointments, I think Wong would be eased out of the PAP’s Central Executive Committee (CEC) as well (he’s currently first assistant secretary-general). Hence his retirement now, rather than later, shows how serious PM Lee is on leadership renewal and ‘transforming’ the PAP. 2. Mah Bow Tan, Minister for National Development since 2001, polled 57.22 percent in Tampines – his lowest winning margin (he first began his political career by losing to Chiam See Tong in Potong Pasir). He was furiously whipped at opposition rallies for the rise in HDB flat prices. Yes, he’d set in cooling measures…but apparently insufficient to cool political tempers. S’porean voters want their accountability, and with such election results, PM Lee had to listen to them – sacking Mah. I’m not sure if his replacement, Khaw Boon Wan, is able to solve the tricky problem of rising HDB prices, especially if the asset enhancement policy continues. That is the root cause of the price increases. In my view, the policy has to be thrown out before most people are satisfied that HDB flats are within their reach. But throwing out the asset enhancement policy will make tens of thousands of S’poreans angry. It’s a tough job, but I think Khaw has done tremendously well at the Ministry of Health. It’d be interesting to see what tweaks or even reforms he would introduce to housing. 3. Raymond Lim, Minister for Transport. What did he do wrong? All right, many S’poreans hate the peak hour congestion, swear at the occasional breakdown of trains, and wants fare prices to go down or remain the same for eternity. But I think there is nothing fundamentally wrong with transport in S’pore. Train stations will be popping up here and there soon, some not in a decade. With some luck peak hour congestion can be alleviated (mind you, not totally solved ‘cos that’s impossible). It’s a matter of enduring…and well, our patience has its limits. So out go Raymond Lim. His replacement is Lui Tuck Yew. My impression of him at MICA isn’t good, so cross my fingers. 1. Vivian Balakrishnan will swop MCYS for MEWR. This is interesting, because MEWR is ranked a little lower than MCYS in terms of budget allocation. Furthermore, MEWR is a quiet ministry doing the background work – water, canals, reservoirs, trees etc – and Vivian Balakrishnan doesn’t seem to be a quiet man. 2. Dr Ng Eng Hen will take over MINDEF. I think this is expected, because he has been 2nd Minister for MINDEF. He didn’t come from a military background, but so did Goh Keng Swee and Goh Chok Tong, who were formerly ministers for defence. But he should relook his MOE public relations fiasco regarding the calculation of mother tongue grades in PSLE, to avoid a similar one in MINDEF e.g. like lengthening National Service etc. 3. Gan Kim Yong to take over MOH. Khaw has done a good job, so Gan would probably continue tweaking the system, like allowing Medishield for persons with congenital diseases. 5. Yaacob Ibrahim shifted to MICA. Or rather, he’s going back to where his political career in government began. MICA is considered a lightweight ministry, where you throw the newbies to test them out. So putting a veteran in a lightweight ministry suggests two things: this veteran is out of favour, or MICA requires a major shake-up. I’d prefer the latter, because in my opinion, MICA is doing more negatives than positives. It’s there because it’s just there – it’s not doing anything plus plus for S’poreans, especially in areas of censorship, cultivation of alternative spaces for artists and government communications. 6. Tharman to become DPM, as I predicted in a previous post. If George Yeo were not voted out, he would have been DPM. But I think Tharman is as good too, given his standing in the international economic arena. And by holding two portfolios of finance and manpower (which makes sense since neither can do without the other), he should be able to tweak or introduce beneficial policies for S’poreans. The issue of foreign talent will be sensitive, and this is where he might trip up or be successful in. 7. K Shanmugam to succeed George Yeo. He sure has large shoes to fill. But he was one of the top lawyers in S’pore before leaping from the backbench to the Cabinet, and he should be able to handle foreign affairs delicately as well. In any case, foreign affairs for S’pore has few options, and I don’t expect major policy shifts even if the minister changes. Two labour MPs, Josephine Teo and Halimah Yaccob, will be promoted to ministers of state. Both were quite critical of some government policies, and with them in government, I suppose they would initiate changes. Surprisingly, they were promoted to ministers of state right away – not parliamentary secretaries, perhaps given their senior roles in NTUC. With Halimah Yaccob in MCYS, I think she would definitely initiate policies for low-skilled, low-educated and low-income workers and their families. Good move. MG Chan is the new Acting Minister for MCYS – a sensitive ministry where I expect the opposition, with an unprecedented 6 elected MPs with legitimate access to the people through Meet-the-People sessions, to hammer the government for not doing enough. How he holds up will be important in both PM Lee’s and the public’s assessments of him. Hopefully he doesn’t use his ‘Ah Beng’ English in Parliament. Surprises – yes. A break from the past – yes. Will it transform Singapore? Not really sure. But with Khaw Boon Wan in housing, K Shanmugan in foreign affairs, Tharman as finance and manpower ministers and DPM, I think most of us can trust this Cabinet. Anyway, we’ve 6 elected opposition MPs + 3 NCMPs to help us ensure these ministers will do their jobs well. But of course expect the official seniority line-up to be different. Foreign Affairs and Defence probably rank higher than MICA or Minister without portfolio, lol. In other parliamentary democracies, especially the Westminster-style, the Leader of the Opposition is the alternative PM (OK, small the opposition is now and nowhere near a Shadow Cabinet). But shouldn’t PM Lee recognise this position openly, like then-PM Goh did to Chiam See Tong in 1991? I think ‘shock’ is an extremely under-stated response to their retirement from political office. In Singapore politics, retirement is always planned in advance, unless in the case of George Yeo, you’re voted out (once-in-50-years event). For example, S Jayakumar’s retirement was probably expected by many political observers. After GE 2006, he had gradually relinquished his appointments of Deputy PM and Minister for Law, before his promotion to Senior Minister. He had reached the pinnacle of his political career, short of becoming PM. When the time came for GE 2011, no one raised an eyebrow when he announced his retirement from politics. Similarly, Lim Boon Heng, Minister without portfolio and PAP chairman, had entered politics the same year as Jayakumar. So his retirement was more or less expected. But not for MM Lee and SM Goh. It is odd to find two former prime ministers in the Cabinet, but co-opting alternative voices has been a hallmark of the PAP (though I think this is increasingly shaky), so instead of forcing both to become private citizens, having both in the Cabinet allowed them to air their views behind doors. I think most political observers and perhaps most S’poreans expected both of them to continue serving as long as their health permits. Furthermore, S’poreans are quite comfortable with ‘recycling’ our top-ranking leaders (OK, abit crude) – former DPM Dr Tony Tan is now chairman of SPH, former foreign affairs minister S Dhanabalan is now chairman of Temasek etc. Having two former PMs in the Cabinet is a form of respect as well as allowing them to contribute positively, especially in the international arena. So why are they retiring from political office now? We have studied the new political situation and thought how it can affect the future. We have made our contributions to the development of Singapore. The time has come for a younger generation to carry Singapore forward in a more difficult and complex situation. The Prime Minister and his team of younger leaders should have a fresh clean slate. A younger generation, besides having a non-corrupt and meritocratic government and a high standard of living, wants to be more engaged in the decisions which affect them. After a watershed general election, we have decided to leave the cabinet and have a completely younger team of ministers to connect to and engage with this young generation in shaping the future of our Singapore. But the younger team must always have in mind the interests of the older generation. This generation who has contributed to Singapore must be well-looked after. It is obvious neither of them had any intention of stepping down BEFORE the elections, but the results of GE 2011 had forced them to take a hard look at their political positions. Firstly, they are not stepping down because of accountability issues regarding the elections – PM Lee himself declared he was running the campaign. 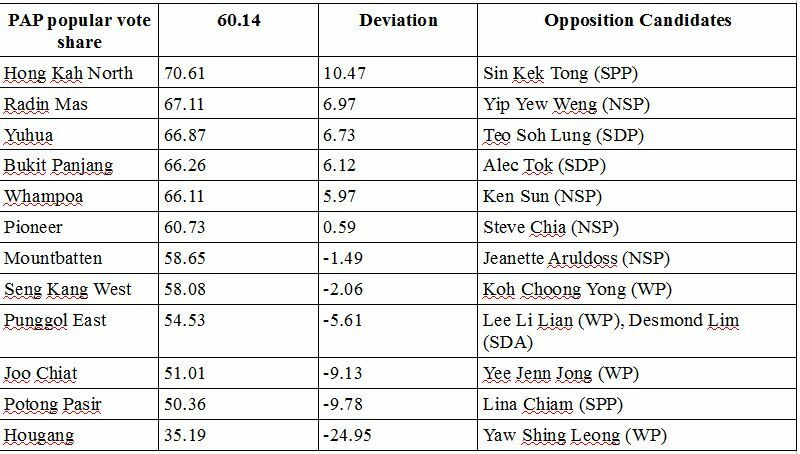 Though the PAP polled its lowest popular vote share since independence, there was no danger of it paralyzed by 6 elected opposition MPs, or worse, lose power. Furthermore, the swing could be attributed to issues such as inflation, housing and immigration – which arguably would become better in the next 5 years, and allow the PAP to recapture some of the swing votes. Hence both of them had stepped down from positions of strength, and probably also in belated recognition that they are not immune to voter resentment. That George Yeo, ranked No. 7 in the cabinet, was voted out probably reminded them that S’poreans are willing to show any minister the door if the opposition puts up a strong and credible team against him. More importantly, SM Goh might have had an epiphany that he was not indispensable – he polled about 56 percent in his Marine Parade, lower than the national 60.1 percent, and much lower than his previous 70-odd points, and that was fighting an unknown, just-arrived NSP team with Nicole Seah being the star, outshining SM Goh’s teammate Tin Pei Ling as the representative of S’porean youth. Finally, both of them had made several gaffes during the campaign – MM Lee’s threat of ‘repent’ to Aljunied voters, and SM Goh back-pedalling on his comments on his former principal private secretary etc. I think younger and some older S’poreans did not think these befit their statures of being elder statesmen. Being in the future Cabinet would be politically costly in the next elections, if both were still around to stand for them, and in the long-term, their legacies would be scarred by a few incidents in the twilight of their political careers. So what this means for the next Cabinet? Current DPM Wong Kan Seng is likely to move up to Senior Minister, and he probably will retire by the next elections. Who would be the next DPM? When voters in Aljunied kicked out George Yeo, not only did Singapore lose a foreign affairs minister, but possibly a future DPM. Traditionally the DPMs were the ministers responsible for security or foreign affairs. The next ranking minister in the Cabinet, Lim Hng Kiang, is one candidate, but he is more of a technocrat than a politician. The second DPM (first being Teo Chee Hean) might be either Tharman, the Finance Minister, or Ng Eng Hen, the Education Minister. Or there could be none at all. Oh, it would be amazing if Mah Bow Tan is still kept in the Cabinet. And in the longer term, without MM Lee and SM Goh making contradictory side-comments, the Cabinet would be more united…but not necessarily more receptive. That remains to be seen. In all, their retirement is symbolic of a changing of times – the PAP has lost the ability to dictate the agenda, force people to argue on it, and then move on according to their directions. The recent GE has proved that both opposition parties and ordinary S’poreans are setting the agenda instead, and forcing the PAP to respond before moving on. MM Lee and SM Goh clearly came from another era, and by retiring, they are giving PM Lee a broad space to respond to the changing needs of Singapore – as they mentioned, “A younger generation, besides having a non-corrupt and meritocratic government and a high standard of living, wants to be more engaged in the decisions which affect them“. As you can see from the diagram, with the exception of the exceptional year 2001, the PAP popular vote share has been hovering in the lower 60 percentage points. 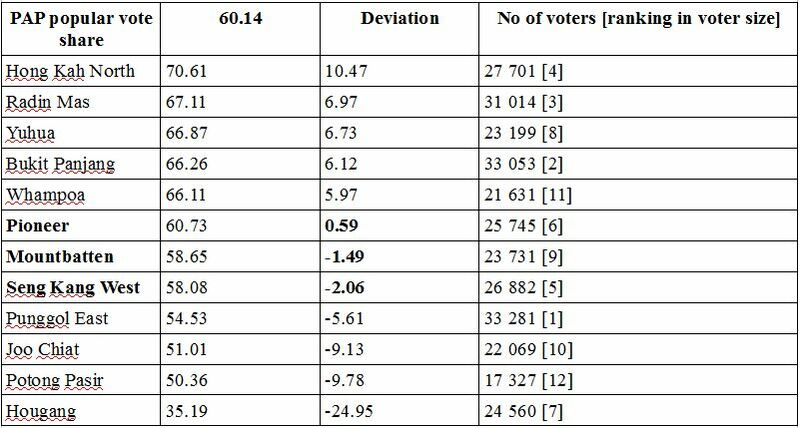 I believe if not for the quality of opposition candidates in some SMCs, the PAP popular vote share would have fallen to between 55 and 60 percentage points, GE 2011 being fiercely contested. 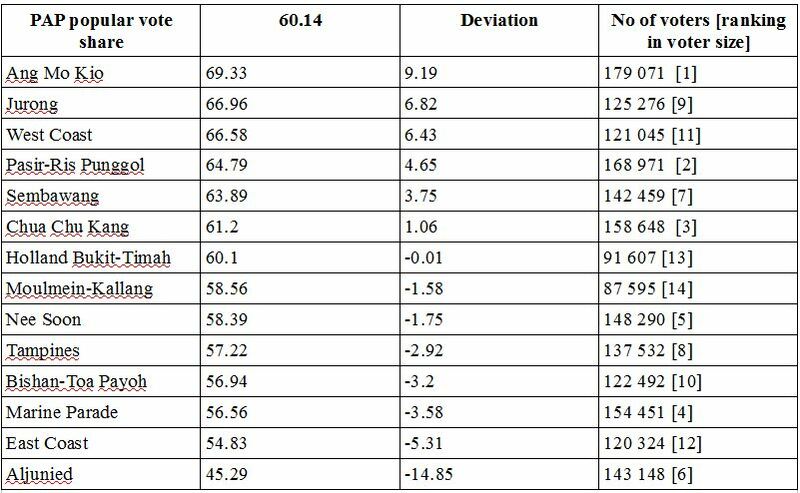 But the trend is this: the PAP vote share has been in the 60s since 1988 (except 2001), and it might continue to decline. For the Workers’ Party, they have never breached beyond 20 percent popular vote share from 1988, but this might be because they did not field candidates in all wards. However, their share of the popular votes has been fairly consistent (again, discount 2001). Ironically, while their popular vote share has dipped from 2006, they secured a record number of 6 seats. This can be attributed to other parties competing heavily against the PAP as well, especially the NSP, which took a nearly equal amount of 12 percent in the popular share. 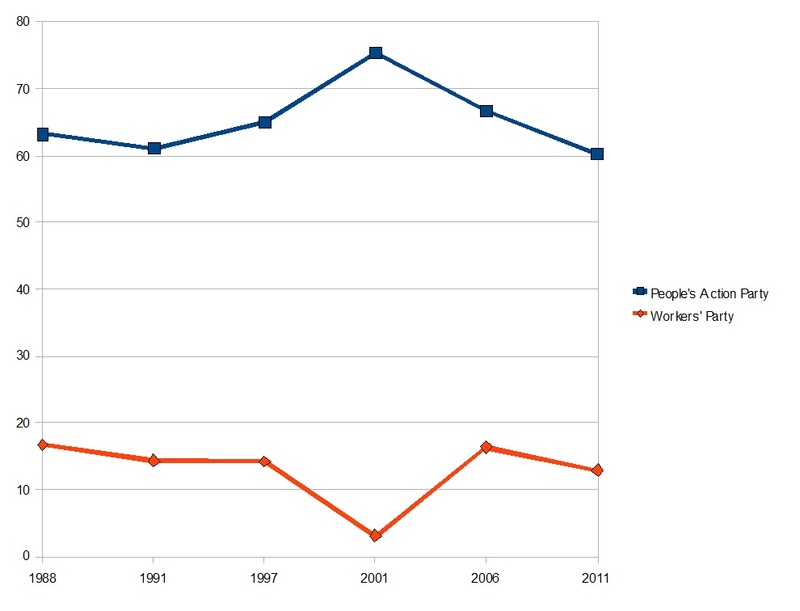 It is clear, over the past 20 years, the WP has consistently remained the No.2 choice of voters. The PAP has been inflicted a psychological blow, in losing Aljunied GRC. The law of large numbers, however, has held up well in other GRCs, so Aljunied might be an exception. But with the loss of 3 ministers, and the lowest popular vote share since independence, the PAP would do a very deep and sombre self-reflection. PAP has lost the ability to dictate the agenda. The PAP has originally campaigned on leadership renewal, 4G leadership etc, but it was obvious during the campaigning period, other issues such as cost of living, liberal immigrant policy, and housing took the stage. The 4G leadership was overshadowed by the WP’s hammering of a “First World Parliament” – such that PAP leaders had to respond to them, rather than pound on their own 4G message. Watershed elections? Yes, in the sense that the WP made a breakthrough. No, that the PAP still dominates overwhelmingly. But as I mentioned in point 3, the PAP can’t return to its heydays of dictating the agenda – it can respond, and respond vigorously it did. MM Lee might be wishing for the good old days of the 1970s and 1980s and perhaps 1990s (when upgrading of HDB flats became a key issue/threat, depends on how you see it)…but Singapore, Singaporeans, the PAP and opposition parties have changed and will change. For good or ill, it is too early to tell. Very quietly, after Parliament was dissolved, PAP MPs who were the chairmen, vice-chairmen and members of their constituencies’ town councils also gave up their town council seats. From then to now, have our wards turned to slums? Your MP does not look after the roads in your neighbourhood (the LTA does that). Your MP does not look after the parks (the National Parks Board does that). Your MP does not look after your public library (the National Library Board does that). Your MP does not look after your sports stadium or public swimming pool (the Singapore Sports Council does that). Your MP does not build shopping malls for you (property developers such as Capitaland do that). Your MP does not manage your MRT line (SMRT does that). Your MP does not manage your SBS buses (SBS does that). Your MP does not look after your electricity supply (SP Power does that). Your MP does not look after your carpark (the URA does that). Your MP does not investigate crimes (the Singapore Police Force does that). Your MP does not put out fires (the SCDF and their NSmen do that). Your MP does not ensure that top schools are near your home (whether a school is top or not depends on the students’ efforts). Your MP doesn’t prevent mosquito breeding (the NEA does that). OK, we’ve to give credit to the co-ordination and lobbying of the MP on behalf of residents to these multiple agencies and corporations. But from what we seem to be hearing and reading, PAP MPs take credit for many of the above items which, well, they don’t really personally do (and sometimes beyond their control). Personally, I think it’s partly the fault of S’poreans too. A MP isn’t a Superman. Painting peeling off the HDB block? MP’s responsibility arh? The MP might be chairing the town council, but it’s the town council which professionally runs the estate. Of course if the town council isn’t doing well and the MP doesn’t recognise this, then the MP is at fault. And partly the fault of the PAP, for over-emphasizing municipal issues. All the slum talk. Have Hougang and Potong Pasir turn to slums? More importantly, if an entire GRC goes over to the opposition, can the PAP government afford to neglect more than 100,000 residents by denying funds?